It isn't two books in one—it's a collaborative effort between two clever people, both of whom have risen to the occasion. The book might be based on battle, but everything we've seen is a winner. 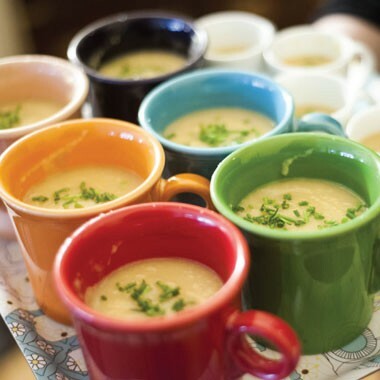 While you are welcome to pick sides, and may find one woman's recipes more appealing, the book's competitive spirit remains friendly, and in the end, it's the reader and home cook that wins. Traditional or not, they are a truly intriguing cookie, with a smoky sweetness that separates them from your standard 'snap. Looking for something interesting to serve at your next cocktail party? Crunchy, juicy, salty-sweet, and single-serving, candied cherry tomatoes taste as good as they look. For best results, make this shortbread the day before... assemble the dough before you go to bed. Pop it in the oven before leaving for the day, and enjoy shortbread when you get home. These cookies are slightly crumbly yet tender mounds of sweetly and salty peanut buttery goodness. Enough said. New York Times writers Julia Moskin and Kim Severson were all of the former, until legendary Times restaurant critic Frank Bruni challenged them to go head-to-head in a culinary duel—a battle for dinner dominance that turned them into kitchen combatants. Armed with only $50 each, Bruni dared them to prepare a full meal for six, a showdown which he would judge for the newspaper. The thrill of battle proved too exhilarating to resist, and that initial clash turned into a yearlong kitchen war as Julia and Kim faced off to tackle the most vexing kitchen predicaments, from how best to console friends in need through old-fashioned home cooking to conjuring kids' food that keeps both parents and children happy at a party. CookFight is the delicious result of their brinksmanship, a chronicle of their skirmishes over the course of twelve months and a look at how two very different people—best friends from wildly divergent backgrounds—approach the kitchen. 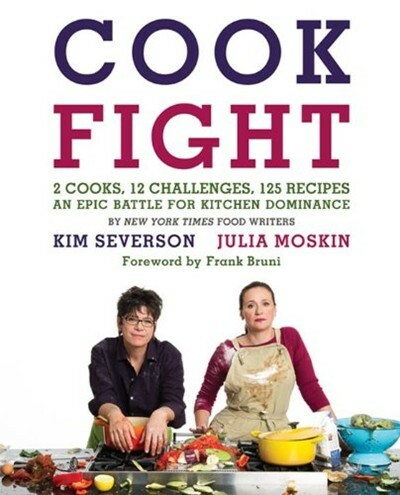 In each heartfelt and hilarious chapter, Kim and Julia confront a new "challenge"—those quandaries all home cooks deliberate, from how to strategize a dinner party (the Fancy Food Challenge) to how to eat more seasonally and locally (the Farmer's Market Challenge). Every recipe, from Julia's Caramelized Corn with Mint to Kim's Carnitas, is a delectable testament to their creativity and savvy—only the reader will be able to call the winner.